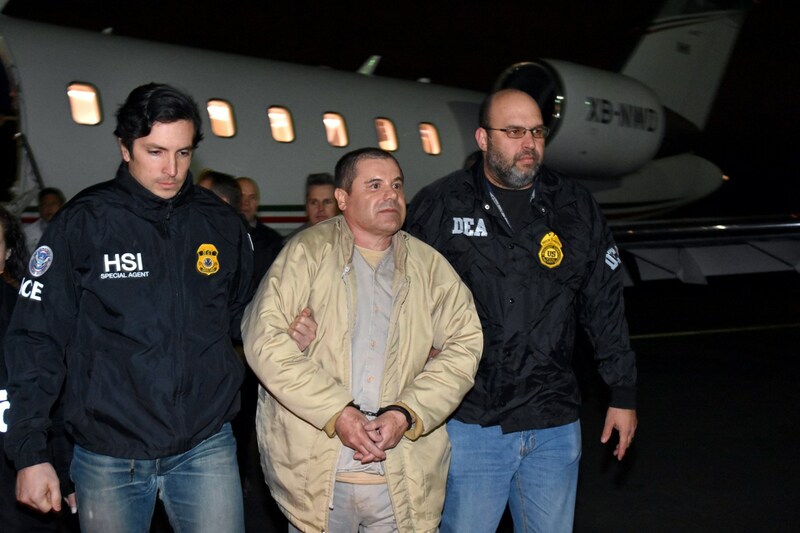 Mexican drug kingpin Joaquin “El Chapo” Guzman has been extradited to the United States, Mexico’s government said Thursday, a little more than a year he was caught following his brazen escape from a maximum-security prison. Several U.S. jurisdictions want to try the former Sinaloa cartel leader on federal drug trafficking charges, including prosecutors in San Diego, New York, El Paso, Texas, Miami and Chicago. A plane carrying Guzman landed at MacArthur Airport on Long Island, New York, at around 9:30 p.m. ET, where dozens of U.S. marshals and other law enforcement officers were gathered. The Justice Department said Guzman was will “face criminal charges in connection with his leadership of the Mexican organized crime syndicate known as the ‘Sinaloa cartel,” and is charged in six separate indictments in the U.S.
Guzman was recaptured in January of 2016 in the town of Los Mochis, almost six months after he used an elaborate mile-long tunnel to escape from a maximum-security Mexican prison. The case took another twist when it was revealed that the actor Sean Penn traveled to Mexico to meet with Guzman in a remote jungle clearing while he was on the run, for an article that appeared in Rolling Stone. Guzman slipped into a hole in his shower at Altiplano prison near Mexico City on July 11, 2015 and fled through a mile-long tunnel outfitted with a motorbike that led to a residential construction site. He was recaptured in a pre-dawn raid by Mexico’s navy in the town of Los Mochis on Jan. 8, 2016. Government forces killed five suspects in a shootout during the raid, Mexican authorities said at the time. Guzman had escaped from a Mexican prison once before, in 2001, purportedly hidden in a laundry cart. Details about where and when Guzman will first appear in a court in the U.S. were not immediately released. Guzman was first taken to New York upon arriving because an indictment there contains a provision that he must first enter the U.S. in that district, the Justice Department. U.S. authorities sought extradition after Guzman was arrested in 2014 but Mexico resisted, declaring it a matter of national sovereignty. Guzman, believed to be 61, has long been a popular anti-hero in Sinaloa and across Mexico for dodging death and evading bullets while turning the multibillion-dollar Sinaloa cartel into one of the world’s most powerful — and ruthless — drug trafficking organization. The Sinaloa cartel has been blamed for thousands of deaths, including the murder of police officers and innocent civilians. A turf war between the Sinaloa and Juarez cartels in Ciudad Juárez claimed 10,000 lives between 2008 and 2012, according to the Congressional Research Service. Guzman oversaw the explosion of subterranean networks used to smuggle massive amounts of narcotics across the U.S. border. U.S. officials have said at the height of the Sinaloa cartel, it was believed to be responsible for up to half the illegal drugs coming into the U.S. from Mexico. The Drug Enforcement Administration in a 2015 report said that of all the Mexican drug trafficking organizations, the Sinaloa cartel has the largest presence in the U.S.
After his 2001 escape, Guzman outfitted many his safe houses with secret doors that opened to tunnels leading to municipal sewer systems. He used one of them, accessed through the bottom of a bathtub, to shake authorities in February 2014. He was arrested a few days later and ended up in Altiplano, the prison that he escaped from in July of 2015.